Join us for the 13th Annual Bicycle, Pedestrian, and Trails Day at the Capitol, Tuesday, April 23rd, 2019. Jefferson City, MO. We need volunteers to help make Capitol Day great - register to volunteer here. Transportation, recreation, health and fitness, sustainability, tourism, business, economic development, and more are all on the agenda - and we will start with advocacy training to help you effectively communicate with your own Representative and Senator. 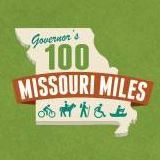 Missouri transportation funding - will it include a fair share for walking, bicycling, trails, and public transportation? Find out all the details about 2019 Capitol Day or register to join us for Capitol Day here. 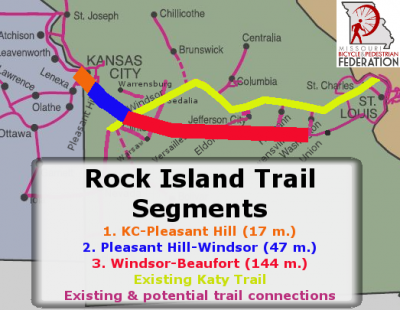 When you join us to ask our state legislators to support bicycling, walking, and trails in Missouri, it really does make a difference! Working to create a world-class bicycle, pedestrian, and trails system in Missouri, to improve the safety of all road users, to build a powerful movement of people in support of bicycling, walking, and trails in Missouri, and to encourage more Missourians to walk and bicycle more often are the four primary goals of MoBikeFed's Vision for Bicycling and Walking in Missouri. Bicycle, Pedestrian, and Trails Day at the Capitol is one of the most important ways we have of supporting ALL FOUR of those primary goals. That is why we hope you will join us April 23rd for Capitol Day! Your ongoing membership and generous financial support help turn our Vision into reality. Bicycle & Pedestrian Day at the Capitol April 10th - Join us! 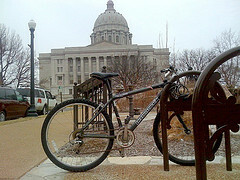 Capitol Day April 13th: Missouri transportation funding proposal leaves out bicycling & walking; we need you!